The FR420_ETHERNET is a 4th Generation relay controller offering the ultimate relay control solution... without exception. Capable of making decisions to control relays based on sensor reading or a time schedule. Fusion series controllers offer easy setup without programming. Fusion controllers can be adapted to any automation application you could imagine. The FR420_ETHERNET has two communications ports! The first port has a Ethernet interface that will allow you to connect the board to a router and communicate to the board over a network. The 2nd port is your choice! Use it as a second communication port with a different interface (a second Ethernet interface will you to connect to a second network), use it to wirelessly communicate to other Fusion boards or leave it empty. The FR420_ETHERNET combines ProXR Computer Control, Reactor Sensor Control, Taralist Time Scheduling, and Remote Access wireless communications, use all feature or just some of them! It's the best of all technologies fused into a single controller! Dual communication port interface means you have choices. Pick any two of your favorite communication technologies: Bluetooth, USB, WiFi, Ethernet, Web-i, 802.15.4 Wireless or RS-232. Fusion Easily adapts to the communication technologies you need most. You have your choice of interface for the second port on the board or you can choose none at all. It's not required to have two interfaces on the board under most circumstances. You can select the interface you need in the Port 2 Interface menu when checking out. If your application does not require a second interface you do not need to purchase one. When using the remote access feature the second communication port is required. Remote Access uses the second communication port on the Fusion controller. Every Fusion controller must use the second port to join in on the Remote Access group. Remote Access wirelessly links your Fusion controllers together. For this see the Remote Access tab above. Before we look into the time activation feature of the Fusion Controller we need to point out the TLEE expansion module is required to use Taralist features. 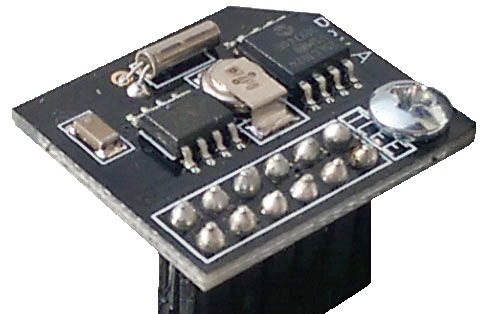 The TLEE module includes the Real-Time Clock as well as non-volatile EEPROM memory used to store the time schedule. Fusion controllers have many ways to control relays, one of the most powerful methods of relay control is based on a time schedule. Fusion Taralist is our third generation of Taralist controllers. The first two major revisions were released as Taralist controllers beginning in 2009. Fusion Taralist refinements extend the capabilities significantly while retaining the reliable core processing engine. Taralist runs as a background task of Fusion Series controllers. Every second Taralist runs through a user-created list of events looking for a time match. When a time match occurs, relays are activated or deactivated according to the schedule. Taralist is also capable of triggering Reactor events when a time match is detected, greatly extending the capabilities of the Fusion controller. Fusion Taralist features are configured using Base Station software (a free download). The use of Base Station is absolutely essential to configuring Fusion controllers. The Taralist features of Base Station software make it easy to build a list of events, allowing you to load, save, and test events during the configuration process. Base Station Taralist configuration sports a new interface with two operating modes, Simplified and Expert. The default mode of operation is Simplified mode, allowing you to build schedules and examine only what is essential for basic schedule editing. Simplified makes it a lot easier for anyone to build a time schedule, as there are fewer features to sift through. The Expert mode adds more user interface functions, helping you tune your event list along the way. Expert mode is for advanced users who need the full feature set of Taralist at their disposal. Base Station now automatically sorts events as you build your schedule, so you can always see the exact order of event processing. Fusion Taralist has very low priority control of relays. A time schedule can control relays, sensors can override Taralist relays (using Reactor features), and computer control (ProXR) overrides Taralist and Reactor. Despite its low priority of the relays, Taralist has high priority over the Fusion CPU, rebooting the CPU or automatically resetting the priority levels based on a time schedule. So Taralist does have provisions for taking control when absolutely necessary. Taralist and Reactor are also capable of working together to control relays instead of prioritized relay control. Using the Fusion Relay Status and Usage Map, Taralist and Reactor can be linked so that a sensor can only activate a relay if the time schedule allows it. The Taralist Event Controller is used to build a schedule of events to be processed by the Taralist processor. There are many elements to this interface that can help you build and test your schedule. The most important rule to adhere to when working with Taralist is the order in which the schedule is processed. All events shown in this list are processed every second. Once the events have been processed, Taralist may automatically elect to refresh all relay banks depending on your event settings. Most importantly, items shown in the top of the list have the lowest priority while items at the bottom of the list will be processed last, so the last events have the highest priority. Just keep in mind, Taralist processes the entire list before refreshing relays. The Time Compensation buffer automatically adjusts the time a few seconds forward or backward to help keep the time calibrated. It is normal for the time to drift a few seconds each day, depending on power supply and temperature of the controller. The Time Compensation control panel helps automatically re-adjust for time drift. The Event Editor has several options that may or may not be added. This allows you to customize the exact time match requirement for your application. The hours, minutes, and seconds check boxes are default options because Taralist requires an exact time to trigger an event. However, you may choose to match on the Day of Week, Day of Month, Month, and Year. The Midnight Backup Buffer is absolutely essential to the functionality of the Taralist controller. Without it, a simple power interruption could result in some relays failing to activate according to a past schedule. A constant power supply is recommended for all Taralist controllers and a UPS style battery backup system is also recommended. However, no matter how many precautions are taken, at some point a Taralist controller will lose power. The Midnight Backup Buffer is used to help protect from simple power interruptions. Here’s an example of how the Midnight Backup Buffer helps protect your time schedule: Imagine a scenario where a relay is turned on by an event on Monday, and turned back off on Friday. However, power is lost on Wednesday for a few minutes. Without the Midnight Backup Buffer the relay will not turn back on until the following Monday. With the Midnight Backup Buffer, a backup is made of relay settings and is used to help recover the relay state just in case power is lost. Users have their choice of many events to trigger when a time match is detected. Some event types are processed constantly so that if power is lost, the Taralist processor can resume where it was at the time of power failure. Such is the case for relay control commands. Keep in mind, the Taralist processor needs power at midnight to back up current settings. Other events are labeled ETMO or Exact Time Match Only. These events required the current time of the Taralist controller to match the time recorded in the event, and will not be triggered if power is lost and then later restored. To better understand standard processing vs. ETMO processing, it is necessary to give an example. Let’s say Relay 1 is set to activate a 9:00 AM using the “Turn On a Relay” event. This is a standard event type. Let’s say Relay 2 is set to activate at 9:00 AM by telling Taralist to trigger a Reactor event to turn on Relay 2. Triggering Reactor events from Taralist requires an exact time match (ETMO). On a normal day, both relays will activate at 9:00 AM. However, if power is lost at 10:00 AM and restored at 11:00 AM, only Relay 1 would turn on.&nbbsp; Since Taralist is constantly processing all events every second, Taralist knows that Relay 1 should have been activated at 9:00 AM, so Taralist decides to go ahead and activate Relay 1 at 11:00 AM to recover from the power failure. When Taralist triggers a Reactor event, this function requires an exact time match (ETMO). If power is restored at 11:00 AM, this event will not be triggered again until 9:00 AM the next day, when the time on the clock exactly matches the time stored in the event. Reactor enables a Fusion Series relay controller to control relays based on sensor inputs. 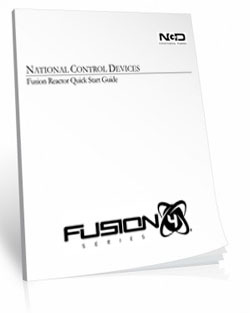 Reactor has the ability to read sensors connected directly to a Fusion controller or to wireless remote Fusion controllers linked using our Remote Access wireless communication technology. This allows Fusion controllers to share sensors with each other in a wireless group. Reactor allows you to mix local and wireless remote sensors together in any combination. Reactor is capable of monitoring up to 16 different sensors, with special provisions for analog and digital sensor data. Reactor also includes 16 counters, used for controlling relay sequences, as well as 16 timers. Reactor is capable of controlling the first 32 relays of a Fusion controller. Additional relays may be controlled using Taralist (time schedule) or ProXR (computer control). Reactor has a preset list of events available. When sensor values match user-defined settings, events are triggered. Events allow you to control relays, flash relays, trigger/reset timers, increase/decrease counters, send/push notifications to a server, and much more. The capabilities of the Reactor processor are greatly expanded when the TLEE expansion module is plugged into the Fusion controller. The TLEE expansion module provides additional memory as well as Real Time Clock, allowing the Fusion controller to control relays based on a time schedule. With the TLEE expansion module installed, users will have many more ways to trigger events. For example, analog sensors will be capable of handling up to 7 limits per sensor with 32 total events per sensor! Without the TLEE, analog sensors are limited to 2 limits per sensor and 12 events. Push notifications are possible for users with the TLEE expansion module installed. Remote Access features allow a Fusion controller to ask other Fusion controllers for sensor data using wireless communications. A TLEE expansion module is required for a Fusion controller to ask another Fusion controller for data. However, a Fusion controller is capable of responding to requests for sensor data without a TLEE expansion module. Put simply, a TLEE is required in applications where the Fusion controller acts as a master (requesting sensor data), but the TLEE is not required when Fusion is acting as a slave (responding to sensor data requests). Reactor also includes a method of associating relays to Timers and Counters. This allows relays to follow the sequence of a counter (with many counting sequence types available). Relays may also be associated with timers, activating or deactivating as timers reach various states. Timer and counters may be combined, allowing relays to be progressively switched as time increases (perfect for runway or driveway light applications). Since Fusion controllers have three separate relay controllers integrated into the firmware (Reactor, Taralist, and ProXR), these three controllers require a clearly defined strategy for managing relay priorities. Without it, relay state changes would be unpredictable. 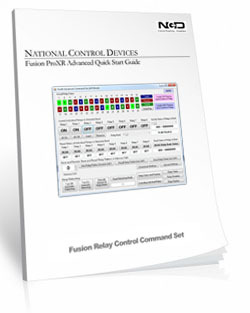 Fusion controllers have a very powerful and flexible relay priority system that is color coded when using our Base Station software, making it easy to see which controller has control of the relay. By default, Reactor relay control has priority over a Taralist relay (time schedule relay), and has a lower priority than a ProXR Relay (computer controlled relay). However, Taralist and Reactor can control a relay cooperatively. Using cooperative relay control you can tie a sensor to a time schedule. The relay priority system can be configured so that both Taralist and Reactor must tell the same relay to turn on before the relay will activate. The cooperative state of the relay may also be changed so that either Taralist OR Reactor can activate the same relay. However, the default cooperative state of the relay is for Reactor to take control and override a Taralist relay, and when this happens, Taralist will be unable to control a Reactor relay. ProXR (computer control) always has top priority over Taralist and Reactor, allowing users to override sensor and time scheduled relay control. Reactor is configured using Base Station Software. Base Station is capable of communicating and configuring a Fusion controller using any supported communication technology. Fusion controllers equipped with Wi-Fi, Ethernet or Web-i interface may be configured remotely over the internet provided port forwarding is properly configured on your router. A static IP address is not required for remote configuration. The objective of ADC is to convert a sensor to a voltage and a voltage to a value. Reactor works with these data values directly, making decisions based on the values. Reactor is capable of reading analog data from various data sources, analog data is limited to 0 to 5 Volts DC. The process of analog to digital conversion is completely managed by the Fusion controller, converting this voltage to numeric values that can be monitored by Reactor. Analog to Digital Conversion (ADC) makes it possible for Reactor to read the light levels in the room and activate relays accordingly. Similarly, ADC allows Reactor to read temperature, humidity, moisture, sound levels, and much more. There are many kinds of sensors that are compatible with Reactor ADC. During configuration, you may see options for 8-bit, 10-bit, 12-bit or other resolutions of data sources. Reading an analog data source at 8-bit resolution means Reactor is capable of reading a voltage from 0 to 5 volts converting it to a value from 0 to 255. Reading an analog data source at 10-bit resolution means Reactor is capable of reading a voltage from 0 to 5 volts and converting it to a value from 0 to 1023. Similarly, 12-bit resolution converts the incoming voltage to a value from 0 to 4095. One limit is defined at a value of 100 (1.95 volts). When the analog value equals or falls below 100, the “Events Triggered Below Limit” are executed. When the Analog value goes above 100, four events are triggered in the “Events Triggered Above Limit” column. Reactor is automatically smoothing the input using the “8-Bit Analog with Data Smoothing” option. Data smoothing may be turned off in applications that may require Reactor to instantly respond to analog changes. Data Smoothing is the default option, making Reactor immune to occasional random voltage spikes that may be presented to the controller in electrically noisy installations. In the sample to the right, a TLEE expansion module is NOT installed, so only two limits are possible for this data source. With the TLEE expansion module installed, seven limits are possible, see example below. A Push Notification is a message sent to a computer from the Fusion controller. Push notifications often contain sensor and relay status information to keep the computer updated on what the Fusion controller is doing, or to notify a computer of any sensor values that may be out of range. Push notifications are triggered as a Reactor event, and may be triggered in the same method as any other Reactor event. Because Reactor events may be triggered from a Taralist time schedule, Push notifications may be sent at specific times of the day. A Push Notification consists of data bytes that may be sent out Port 1 or Port 2 on the Fusion controller. It is not possible to send a Push Notification on Port 2 if Remote Access is configured. Remote Access allows Fusion controllers to exchange data among each other, whereas Push Notification should only be used to send data from a Fusion controller to a user or server. Push notifications have a few customization variables that indicate the data content of a Push Notification. A Push Notification may consist of only a few bytes of data or as much as 44 bytes of data, depending on the options you have chosen. The Push Notification Setup window does not really have too many user-configured options, despite the size of the window. This configuration control panel uses most of its screen space demonstrating the organization of a Push Notification data packet, greatly simplifying software development for interpreting Fusion Push Notification data packets. Push notifications are configured using a few checks to indicate data that is to be included in the data packet. Header Bytes 1 through 4 shown below may be used for anything or to help identify the controller that sent the Push Notification. Push notifications can be sent to Port 1 or Port 2. Port 2 will be unavailable if your Fusion controller is configured for Remote Access. Use Reactor events to trigger push notifications. Taralist is capable of triggering Reactor events. Send commands from any Fusion controller to any other Fusion controller. Using Remote Access, 257 relay controllers can act as one gigantic relay controller. All 257 relay controllers must be within 1 mile, line of site, for proper operation. Remote Access uses the second communication port on your Fusion controller. Every Fusion controller must use the second port to join in on the Remote Access “group”. Remote Access wirelessly links your Fusion controllers together. Up to 257 relay controllers can be wirelessly linked together using Remote Access (Master + 256 Wireless Remote Slaves). What you end up with is a single, gigantic relay controller with all the pieces spread up to one mile away. Every remote Fusion controller is capable of talking to the entire group, so every Fusion controller can act as a Master or a Slave to another Fusion controller. Building this group is what configuration is all about. Tunneling is the ability to use a Fusion controller to take control of another Fusion controller. Tunneling essentially turns your Fusion controller into a modem or communications relay station, forwarding all commands directly to a remote Fusion controller. Tunneling can effectively double the useful wireless range of a Fusion controller as it is possible to send wireless commands to a Fusion controller and have this controller forward your commands to a remote Fusion controller. Remote Command Execution is where one Fusion controller forwards a single command to a remote Fusion controller. If you are a software developer, you can easily forward commands to 256 different Fusion controllers in the local area. Remote Command Execution is instantaneous, allowing you to process up to ten commands per second. Instantly control relays in the pool house, the kitchen, the office, or open any of the doors to your 20-car garage! Read sensors all around the estate to gather temperature, humidity, light levels and even ground moisture. Your software talks to one controller, Remote Access COMPLETELY handles communications to all 256 slaves. Remote Data Collection is a Reactor feature. Using Remote Data Collection, Reactor has the ability to access up to 16 remote sensors on any of the first 16 wireless Fusion controllers that are connected to the Remote Access group. Reactor can be configured to control relays automatically based on remote sensor values. Fusion series controllers are capable of communicating to I2C devices such as temperature sensors, gyros, accelerometers, light sensors, humidity sensors, non-volatile EEPROM, SRAM, and many other types of I2C devices. The I2C capabilities of a Fusion controller provide users with a pathway to access these devices using any of our interface technologies. Select Fusion I2C capable devices support at least two I2C communication ports (Port 0 and Port 1). 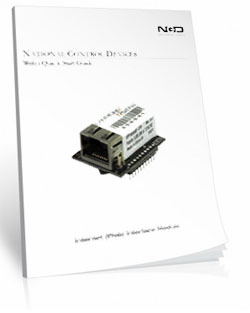 Port 0 has a fixed communication rate of 100 KHz and may be used by NCD devices that contain integrated sensors, I/O Expanders, or other types of I2C devices. Though we may allow access to Port 0 on select controllers, Port 0 should generally be considered for use by the NCD products and peripheral devices. For instance, we may offer expansions that offer additional features by utilizing Port 0. Port 0 is typically accessed using the FXR Relay Expansion Port. I2C Port 1 is for general use by our customers. Port 1 is available for on AD8 Port 1 (shared with UXP Port 1) using I/O Lines 1 (SDA) and 2 (SCL). I2C Port 1 can be tuned for faster or slower speeds. Slower speeds allow Fusion controllers to communicate I2C data over longer distances while faster speeds offer greater compatibility. Fusion I2C Port 1 supports 500 Hz, 1 KHz, 10 KHz, 50 KHz, 100 KHz, and 130 KHz communication speeds (which has all been precisely timed with an oscilloscope), and supports I2C device clock stretching, as required by the I2C communication protocol (a feature often skipped by most I2C implementations). Development of the I2C communication routines were centered on a 24LC515 Non-Volatile EEPROM, and has been tested with various I2C sensors to prove functionality. Use of I2C communication functions on Fusion series controllers require prior knowledge of I2C, as it is outside the scope of our documentation to go into a detailed explanation of the protocol. Here we will focus on the data exchange between a computer and the Fusion controller. The Fusion controller will manage the data exchange with the I2C device, greatly simplifying the amount of information that must be studied. When working with I2C for the first time, it is helpful to use the 24LC515 EERPOM connected to a Fusion controller. The 24LC515 demonstrates 2-way communications with the device, showing you how to read and write data as shown in the sample provided in Base Station software. For complete details on the I2C protocol there are many resources available online, some of which have some very good descriptions of the protocol itself. Most of the detailed protocol information may be skipped when working with a Fusion controller as the difficult part of communications is completely handled by the firmware. Even so, there are a few things you need to understand before you can successfully implement communications to an I2C device. 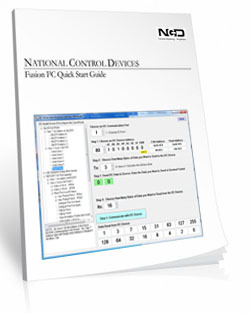 Full descriptions can be found in the Fusion I2C Guide in the Data Sheets tab above. Fusion Series controllers have some very important commands that warranted their own control panel. The Fusion Master Control Panel is used to control the performance of the Fusion CPU as well as control the three most important background tasks. 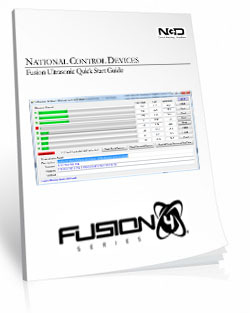 The Fusion Master Control Panel also allows you to download and upload device settings to the controller. Great for backing up certain features of the Fusion controller. Turn Taralist Event Processing on or off with this control panel. When off, Taralist event processing will stop functioning, but the Taralist command set will continue to function. Turn Reactor Event Processing on or off with this control panel. When off, Reactor will stop evaluating sensors. Note that if this function is turned off, Remote Sensor Data Collection stops functioning, as remote data collection operates under Reactor. The interface will NOT reflect this condition, as the interface is designed to directly modify the on/off states of each of these three features. Turning off Reactor Processing does not turn off Remote Sensor Data Collection, but it does stop the task that calls Remote Data Collection. Turn Remote Sensor Data Collection off to stop communications with wireless sensors. This feature will stop functioning if Reactor Processing is stopped. Remote Data Collection is used by Reactor to access wireless sensors. Remote Access should be turned off when tunneling to another device or when sending commands to a remote device. Reactor Event Processing Speed is used to control how fast Reactor reads sensors and makes decisions to control relays. Users might be tempted to set this value to full speed, however, this will affect performance of other background tasks and may cause relays to glitch on and off if a sensor is setting on the threshold of a relay control operation. Users should experiment with this setting, keeping in mind the default processing speed is 7. Small adjustments and experimentation is advised. The speed of Remote Sensor Data Collection can be adjusted using this control panel. This is a rather intensive operation for the Fusion controllers, as very large API packets of data must be assembled and sent as a background task. Decreasing this speed significantly increases the workload of the Fusion CPU. Experimentation is advised as this function will slow the performance of the CPU for other tasks, including communications with a computer. Users are advised to set this setting as high as possible so Fusion has plenty of time to service other tasks. Sensor Trapping is an experimental feature. If a sensor detects a value that is out of range, the sensor value can be trapped for the number of seconds defined by this setting. When the sensor is trapped, the actual value of the sensor will be ignored. Instead, the trapped value will be shared. The Power-Up State of Reactor, Taralist, and Remote Access may also be controlled from this control panel. Note that these functions modify internal EEPROM memory that is only examined when the controller first powers up. Fusion Controllers contain EEPROM used to store various configuration settings. The Fusion Master Control Panel should be used to directly load and save EEPROM data into a Fusion controller. With 2 UXP expansion ports, Fusion controllers know how to expand. Easily add Analog to Digital Converters, Contact Closure detectors and digital potentiometers to your Fusion controller. Fusion controllers also support I2C devices, adding a wide variety of sensors to meet your application objectives. The FXR Expansion Port allows you to add expansion relay boards to your Fusion controller. Configure your Fusion Relay controller to read up to 16 contact closure inputs, making light work of complex relay control tasks. Connect magnet detection sensors, break-beam detectors, contact-closure output current sensors, or any kind of switch you can imagine. Fusion Series Relay Controllers will monitor your sensor and trigger relays or send a notification to your server if any sensor is triggered. With 16 programmable I/O lines available, Fusion Relay Controllers can easily interface to a variety of logic circuits, ideal for the expert developer who needs low-level bit control. Program any I/O line as an input or output. Read and Write individual data bits or read and write data one 8-bit port at a time. 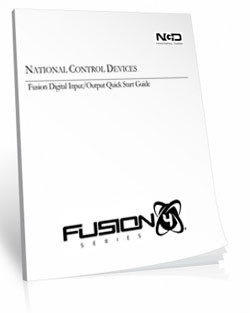 Fusion Series controllers include 16-Channels of Analog to Digital conversion, capable of reading many popular sensors with an output voltage of 0 to 5VDC. Interface to photocells for light sensing applications, thermostats for temperature sensing applications, or interface to potentiometers, current sensors, or any other device capable of providing a 0 to 5VDC output. Fusion Series Controllers include a I2C port for access to devices such as gyroscopes, high-resolution analog to digital converters, digital to analog converters, port expanders, potentiometers, light, temperature, humidity sensors, and much more. A second "hidden" I2C bus in the Fusion Expansion Relay (FXR) Port allows us to develop a wide variety of I2C and Relay Expansion devices combined on a single expansion. Fusion Series controllers include TWO UXP Ports allowing interface to a variety of NCD expansion devices. Expand contact closure input detection up to 2,048 Channels per UXP Port. Add 16, 32, or 48-Channels of 12-Bit Analog-to-Digital Conversion per UXP port, expanding your Analog input capabilities up to 96-Channels per Fusion controller! 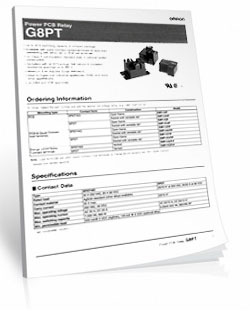 Each UXP port is also capable of controlling 256 Potentiometer output channels. Connect a simple Breakout board to the UXP port to access the 8 programmable digital I/O or 8/10-Bit Analog input channels. Fusion Series controllers easily interface to Ultrasonic Transducers capable of accurately measuring distance up to 6 feet with .250" (6.35mm) resolution. Use Ultrasonic sensors to control relays if an obstruction is detected. Up to 8 ultrasonic transducers are supported by the Fusion series CPU. Fusion Series controllers are equipped with our Second Generation FXR Relay Expansion Port. The FXR Port carries the same relay control data as the XR Expansion port found in earlier controllers. 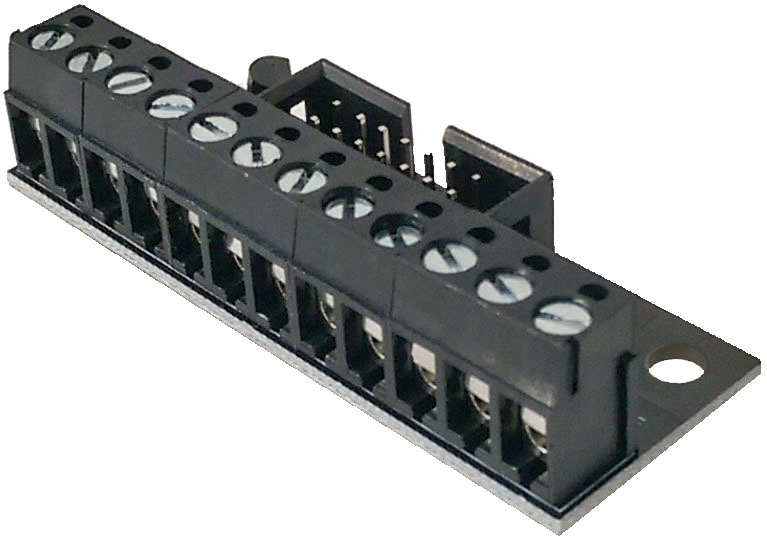 Expansion boards can be added using the FXR expansion port and can control up to 2566 relays. Expansion boards are not available with 20 or 30 amp relays installed. The TLEE expansion module defines the way a Fusion controller is configured in Base Station software. The Fusion CPU has a small amount of memory used to store essential settings. By itself Fusion can do many things. However, the really powerful features require the memory resources of the TLEE expansion module. The TLEE Module is required for most Reactor (Sensor Control) Features, all Taralist (Time Schedules) features and Push Notification. Not required for all functions so we offer it as an option at checkout. Connect a simple Breakout board to the UXP port to access the 8 programmable digital I/O or 8/10-Bit Analog input channels. The AD8 8-Channel Expansion Module provides 8 0-5 volt analog inputs capable of reading many popular sensors with an output voltage of 0 to 5VDC. Interface to photocells for light sensing applications, thermistors for temperature sensing applications, or interface to potentiometers, current sensors, or any other device capable of providing a 0 to 5VDC output.